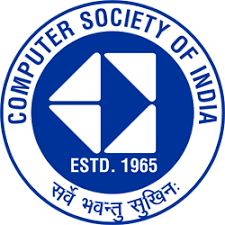 Computer Society of India ( CSI) is the first and largest body of computer professionals in India. It was started on 6 March 1965 by a few computer professionals and has now grown to be the national body representing computer professionals. Through the initiatives of Professor Rangaswamy Narasimhan, the first President, CSI has been in close liaison with International Federation for Information Processing (IFIP) its inception in 1965, when observers from India attended the IFIP Council meeting. - Facilitate Research, Knowledge Sharing, Learning and Career Enhancement among all categories of IT professionals. - Inspire, nurture and assist students to integrate into the IT community. - Percolate benefits of IT advancement to all sections of Indian Society. 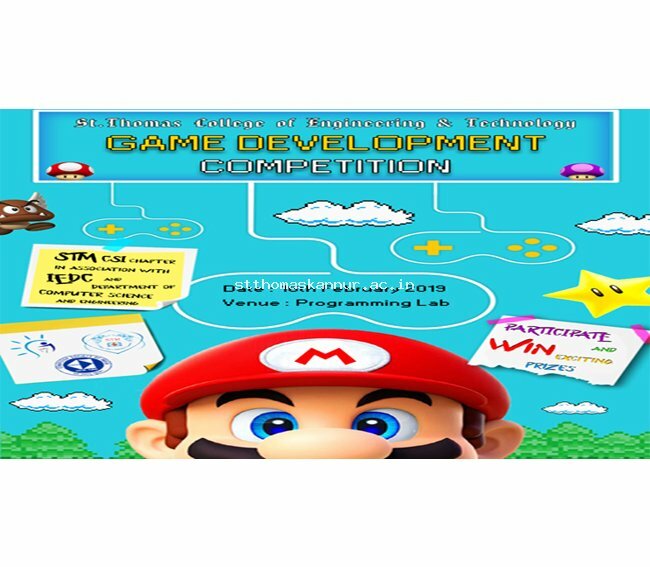 STM CSI Chapter in association with IEDC STM & Department of Computer Science & Engineering conducted A Game Development Competition on 16th February 2019 from computer programming lab. The idea behind this competition is to prepare students to make a game/ software based on a document provided to them, which will be the common procedure on companies during their job. 28 Students were participated in this competition. Sreerag E, Vishnu N (S6 CSE) and Abhishek P K (S8 CSE) won 1st, 2nd and 3rd prize respectively. The inspiration behind this competition is that Windows 7 Operating System in our Computer Lab, Departments, Library, Store etc are frequently becomes slow by keeping a large number of files in the desktop. The users of these systems are not deleting files after use. We are in need of a Desktop cleaner application that moves files from Desktop to some other drive in the system automatically every day. Some softwares like this are available but none of them are open sourced or doesn’t meet our exact requirements. So we are planning to conduct a competition among students to develop a Desktop Cleaner Application and publish it as Open Source Sofware. The Prize Distribution Ceremony of the Software Development Competition was held on 16/11/2018 at 12:00 PM from STM Seminar Hall. The cash prize and certificates for the winners & participants were distributed by Dr.Shinu Mathew John (Principal), Asst Prof. Anitha Mary Soman (Academic Coordinator), Asst.Prof. Nithin N(Head, Department Of Mechanical Engineering). 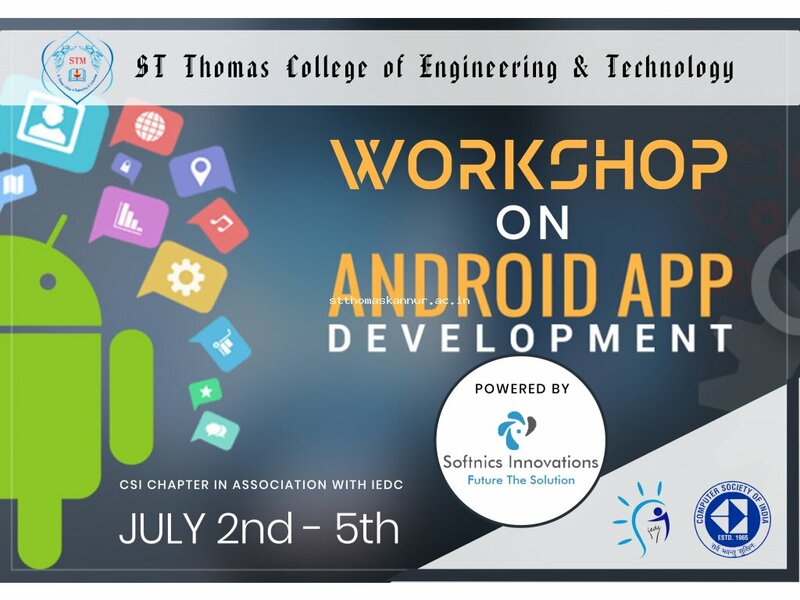 STM CSI Chapter in association with IEDC STM conducted Four-day workshop on Android App Development from 02/07/2018 to 05/07/2018. The resource persons for the workshop were the founders of Softnics Innovation – Mr. Vaishak K, Mr. Adarsh P, Mr, Arjun V Menon and Mr. Vishnu Prasad K V, who have a lot of experience in conducting Android development workshops in different colleges and institutions. The workshops sessions were fully interactive and hands-on. The workshop was conducted with a screen sharing software called ‘TightProjector’, so that the participants could always access the presenter’s screen. The resource persons train the students from the scratch about the development of Android applications. The valedictory function of the workshop was held on 05/07/2018 at 3:00 PM from STM Seminar Hall. The certificates for the Trainers, Coordinators and participants were distributed by Dr.Shinu Mathew John (Principal), Asst Prof. Anitha Mary Soman (Academic Coordinator), Asst.Prof. Jithin P (Head, Department Of Computer Science And Engineering), Asst. 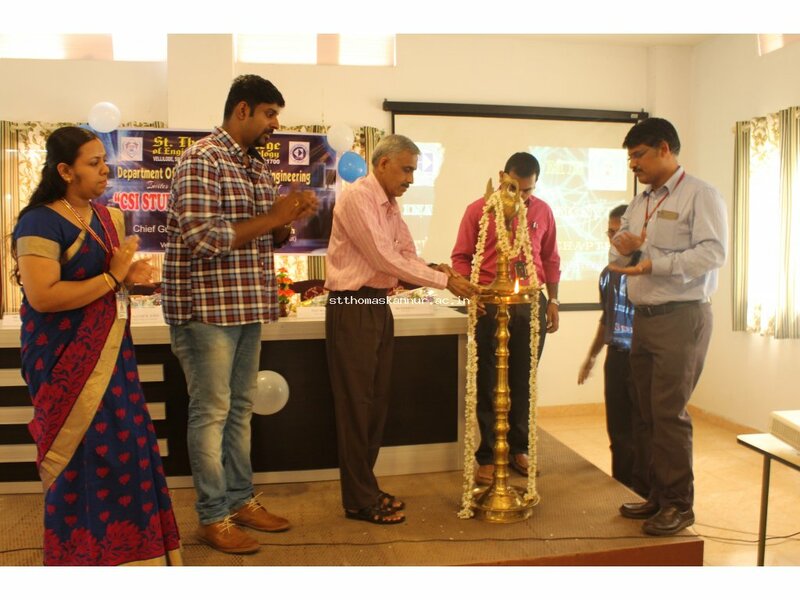 Prof. Rijoy Mathew(Head, Department Of Electronics and Communication Engineering) and Asst. prof. Divya Rajan(HOD in Charge Civil Engineering). A talk on “Knowing the Industry, Being the Entrepreneur” was held on February 19 th , 2018 at Seminar hall from 10.00 AM to 12.00 PM. Our chief guest Mr. Shamnas M T, CEO , Bodhi Info Solutions Pvt. 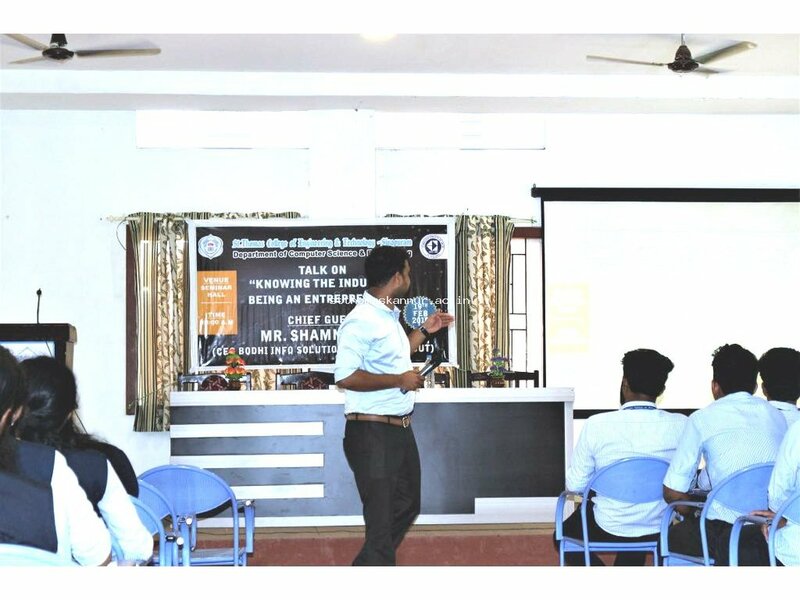 Ltd , Calicut delivered the talk to our CSI student members. The talk aimed at motivating the students with the idea of industrial experience. He talked about what happens inside an industry. The session was very interactive. The students shared their views and ambitions after completing their B.Tech degree. He conducted a mock interview for the students. The final year students who attended the campus placements were very good at mock interview. The junior students got an experience with this interview session. A talk on crypto currency was held on 2 nd February, 2018 at Seminar Hall from 1.30 PM – 2.50PM. 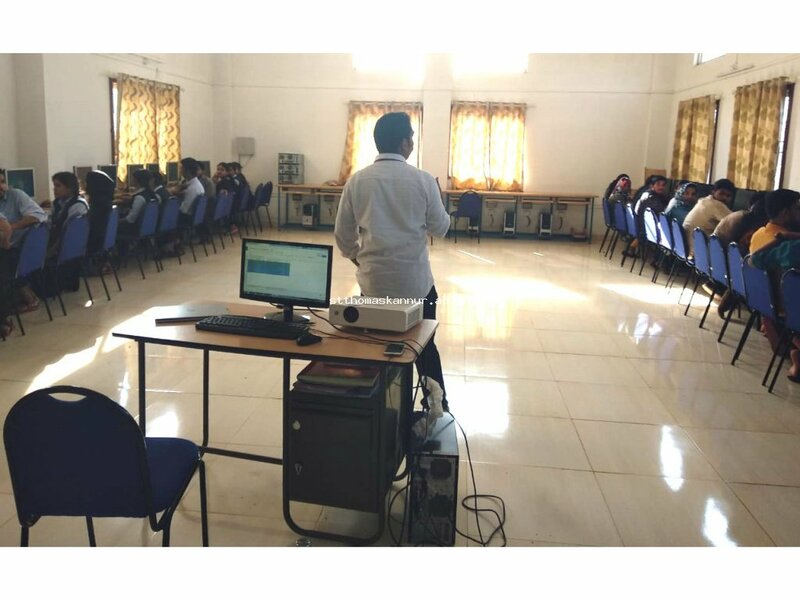 The class was handled by Prof. Jithin P, HOD, Department of Computer Science and Engineering. A cryptocurrency (or crypto currency) is a digital asset designed to work as a medium of exchange that uses cryptography to secure its transactions, to control the creation of additional units, and to verify the transfer of assets. He introduced the concepts of crypto currency to students. He told the benefits and drawbacks of using digital currencies in transactions. He used visual aids to deliver the talk. He showed the legality in doing transaction. The talk aimed at introducing the digital transactions. How they are done using internet facility etc. Four day workshop on Web Development was conducted by STM CSI Chapter from 26/12/2017 to 29/12/2017 in association with IEDC STM. The resource person for the workshop was Prof. Jithin P, HOD, Computer Science Department, an experienced web developer. The workshops sessions were fully interactive and handson. The workshop is conducted with a software called ‘TightProjector’, so that the participants can always access the presenters screen. On Day 1: Basic concept of HTML5 such as tables, form, list, paragraph, css etc were introduced and participants developed sample website using the technologies they learned. On Day 2: Advanced concepts in CSS and Bootstrap were discussed and participants modified the pages they developed on Day 1, using Bootstrap stylesheet. On Day 3: Web development using PHP and MySQL were discussed and participants developed a sample registration form. On Day 4: Web hosting using Cpanel were discussed and all participants hosted the sample website they developed. 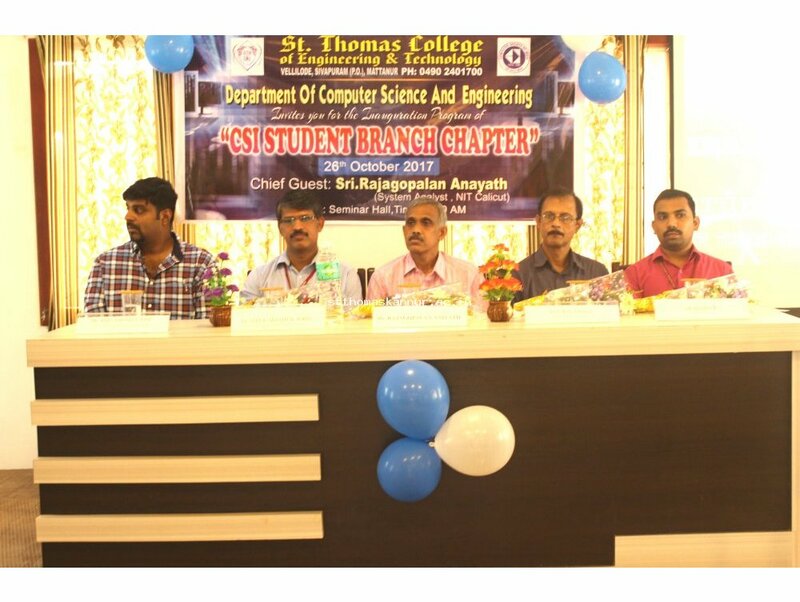 The talk aimed at implementing FOSS- based education in colleges by motivating students. The importance and evolution of FOSS were the main topics. He discussed about wide area of opportunities in IT sector . He also told the benefits of FOSS in the career of . The students got an idea on Free and Open Source Software(FOSS). The session was concluded and Abhiraj , convener of CSI Student Branch Chapter provided the feedback for the session.